I had fallen out of love with sinigang more than ten years ago. Or perhaps I was not in love with it to begin with? Sinigang is a soured soup and it is *the* Filipino national soup, just like adobo is *the* Filipino national dish. Everybody I know who grew up in the Philippines seems to be quite enamoured with sinigang, in all its variations: sinigang na bangus (milkfish), sinigang na baboy (pork), sinigang na hipon (prawn) and so on and so forth. I recall Yaya (our cook) doing our sinigang with tamarind juice that she extracts from the tamarind pods. I don't recall when she stopped doing all that work and started using the sinigang packets so ubiquitous nowadays. It was those sinigang packets that ruined the dish for me. 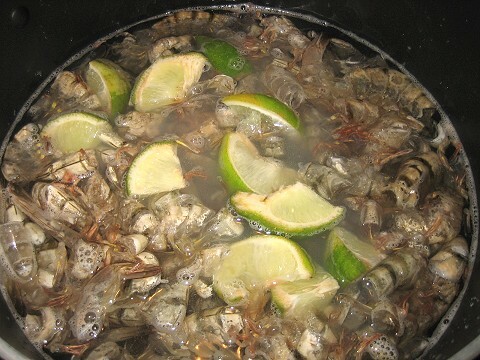 That and the spree of sinigang-cooking that we had approximately twelve years ago. We had sinigang once a week for almost two months. By the end of it all, I dreaded even the smell of it cooking. When I braved the smell and ventured into eating it, I recoiled from the aftertaste. See, on a sip, the first hit of the sourness would be welcome, but after that, there was usually a weird-ish, sweet-ish, off flavour that I can't quite place. Given that the constant in all these sinigangs is the packet, I'll blame the packet. When we thought about our tamarind series, the first dish to come to mind was, of course, sinigang. 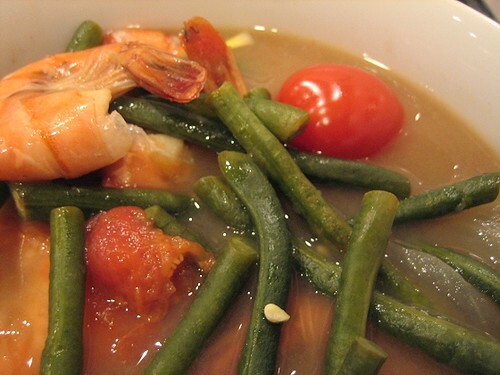 Perhaps by going back to the "traditional," "old-fashioned" way of making a sinigang, we can redeem it. Perhaps I can even fall in love with it. Again. Or for the first time. 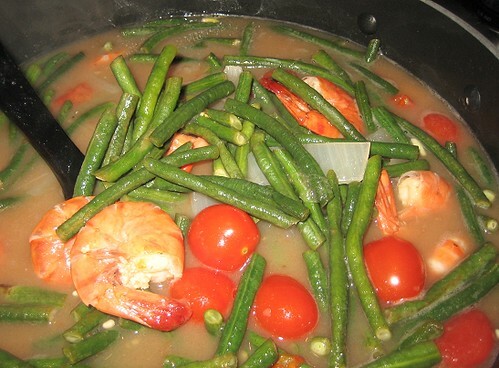 Of course, we had no idea how to make sinigang using real tamarind. Everyone we know uses the packet mixes! So, winging it was the order of the day. 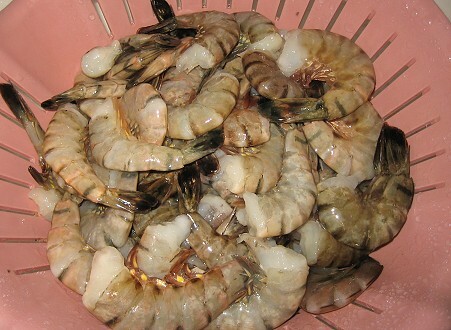 We had bags and bags of shrimp shells in the freezer. According to JS, we have about 12 bags in there. I didn't bother to look for all of them. I pulled out 4 and dumped them into cold water. I added the limes leftover from our pad Thai. While waiting for that boil, I prepped a couple of onions. 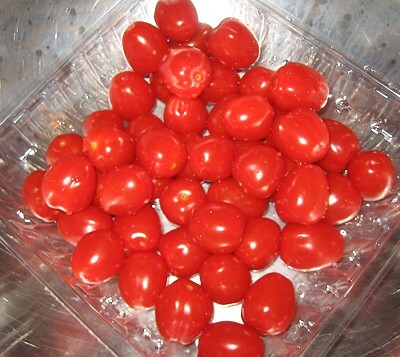 We didn't have "real" tomatoes, just these mini ones. So I just washed them. 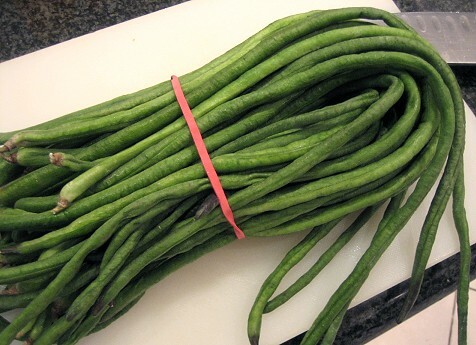 I believe that these Chinese long beans are sitaw, but I'm not sure. 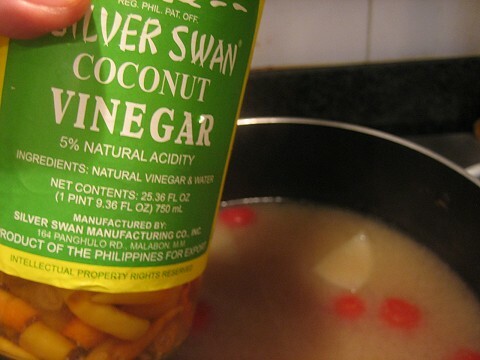 In any case, sitaw is a traditional ingredient in sinigang, I think. But, we've been using green beans for the longest time. 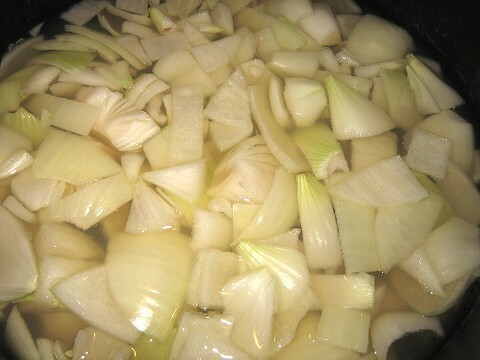 After the stock came to a boil, I turned the heat down and let it simmer for a little while. I don't remember exactly for how long, but let's say it was 20-30 minutes. At this point, I was starting to be afraid. When I tasted the liquid, it just had a very one-dimensional taste. Basically it tasted like water with some things added to it! Not a broth at all. So, to rectify this, I started thinking of other ingredients to add. That vinegar is our homemade chile vinegar (made by plopping chile peppers into a bottle of coconut vinegar). Later on, however, my sister insisted that we use cane vinegar instead. It's not pictured here, but our cane vinegar is the same Silver Swan brand. 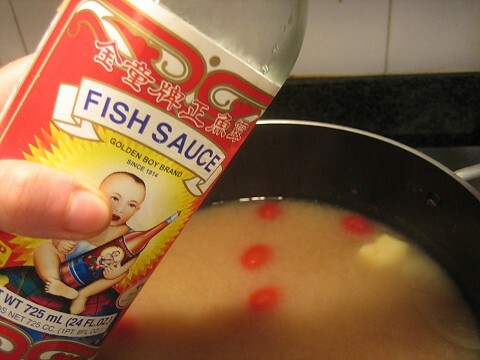 We added fish sauce and vinegar to the liquid throughout this uneasy, unsettling, fear-ridden time. 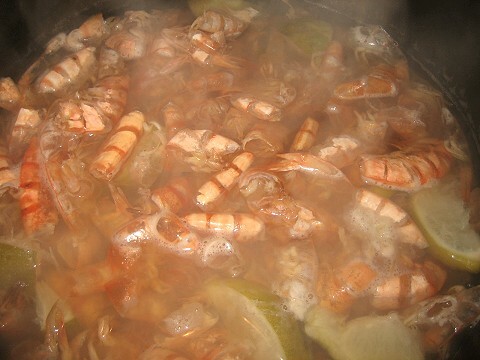 Finally, to end the delay and because I had no choice but to forge ahead with this not-soup liquid, I added the shrimp. They were washed but unpeeled. After many tastings of the liquid, we decided that we needed more tamarind! So, I had to pulp-ify a new brick of tamarind. The resulting sinigang therefore had one and a half bricks of tamarind. The long beans were added last. Relief, they added a much-needed layer of flavor and a very nice "green" aroma. 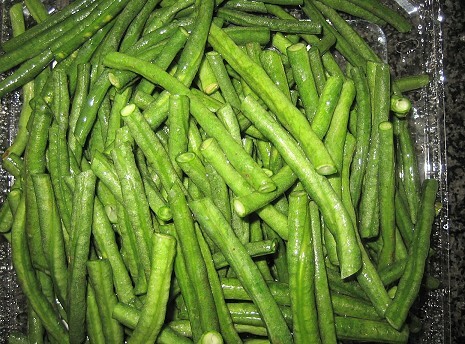 However, I didn't know that long beans took longer to cook than regular green beans! The soup -- yes, it was a soup, at long last -- was already ready, but the long beans were a bit too "crunchy". This was remedied after subsequent heatings of the soup. This was very good -- and NONE of the weird aftertaste that our other sinigangs have suffered from. Perhaps I was right: it was those sinigang packets ruining this whole dish for me. My only complaint was the string beans. It wasn't tender enough by the time the soup finished cooking. It could have gone earlier into the broth. We'll make this again. I can already think of the possibilities! I can't wait to have a version with fish and/or kangkong. 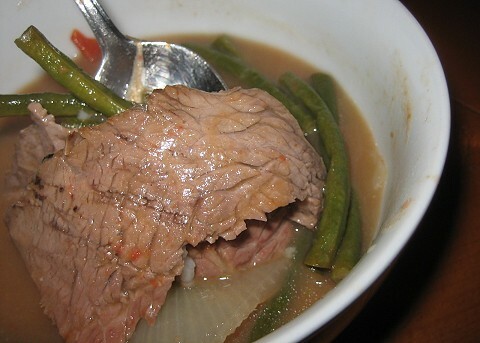 I think I would like a beef sinigang next. I added some slices of the roast beef we made and it was even better! Fascinating blog you have here. I've got much love for Asian cooking, but some of its finesse evades me – I think possibly you might have to develop a 'sense' for how much of an ingredient to use. I recently cooked a Laksa from scratch (as opposed to using a paste) using pureed Tamarind I got from a local Chinese supermarket in a jar. The recipe also called for coriander root – but I'd just got a bunch, and only realised when I got home, so had to guestimate the amount to put in from the directions. Both tamarind and coriander strike me as quite powerful ingredients. The result was quite nice, certainly aromatic, but *very* sharp and sour – with definite overtones of coriander. Oh well, you live and learn! Anyway. Will check back. Keep on cookin'! We've never attempted a laksa before. Hmm, maybe that should be in the to-cook list. Thanks for visiting! 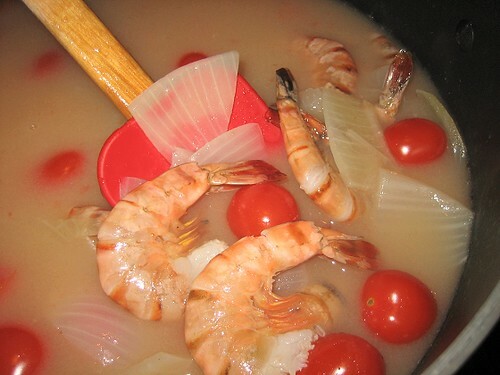 Tamarind doesn't have to be used to make sinigang; any other souring agent will do. However, tamarind is the most available, since it even comes already in pulp form. I've heard of sinigang made with kamias, santol -- both are types of fruit that I haven't found available. I've also heard it sinigang being made from starfruit/carambola, but we have't tried that. If i may offer suggestions on making sinigang using tamaraind, buy the fresh tamarind if available. To extract juice from tamarind, just put them in a small pot filled with water just enuf to cover them. 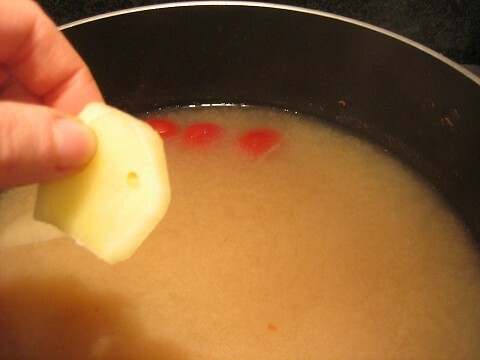 Place on high heat till it boil then turn down heat to a minimum. Cover partially coz it will bubble up. 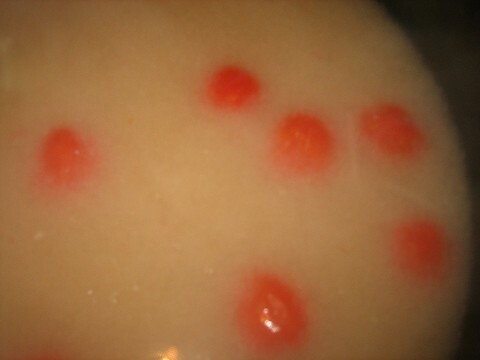 After the tamarind has turn soggy and the seeds starts popping out, turn off the heat. Get a strainer with an empty bowl underneath, pour the mixture on the strainer. Get a fork and press against the tamarind in the strainer to get additional juice. Let the sediments in the bowl settle and just use the clear portion of it. This way your soup will not turn very cloudy. 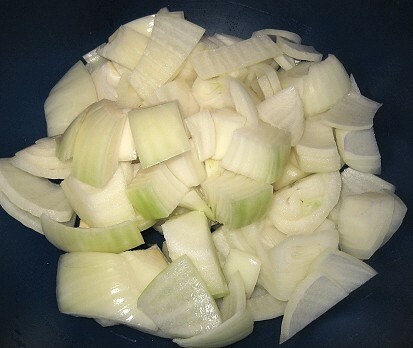 Also you dont need too much white onions and certainly no vinegar should be added. 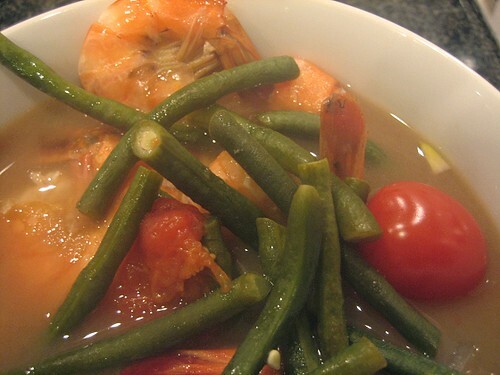 You can also add okra and eggplant as well as swamp cabbage(kangkong) for an authentic sinigang soup. Hope this helps. Thanks for the detailed instructions! We've never tried using fresh tamarind, just those block ones. Fresh ones may be a little hard to find.